Old map by William Hogarth -Strolling Actresses Dressing in a Barn. Title: Strolling Actresses Dressing in a Barn. Size: 17.3 x 21.5 inches. 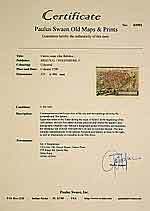 Condition: A good strong impression on thick wove paper showing the plate-mark all round, rare for this large print, in very good condition with very slight toning extreme bottom left corner. Plate 440 x 545mm plus good size margins. Very fine impression of the first published state. 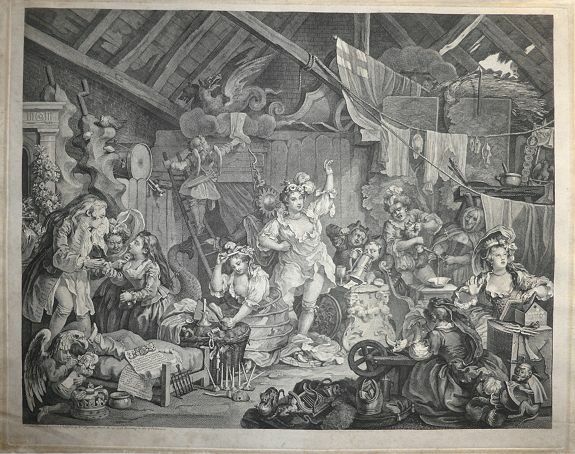 Hogarth's theatrical satire, showing a company of touring players dressing and rehearsing their parts in ‘Devil to Pay in Heaven’ in a barn. Walpole's infamous bill closing all provincial theaters, and also including all the London theaters, except Lincolns Inn Fields and Drury Lane. The scene portrayed can be dated c.24th June 1737, when the unlicensed theaters were forced to close under the Licensing Act. From the playbills on the bed in the foreground, it is evident that this is a provincial company about to put on its last performance. Hogarth's contempt for the Act is seen throughout the engraving. Nine actresses, and four child actors, are dressed as classical deities preparing for a performance; among the props and costumes are kittens playing with an orb and lyre, a monkey urinating in a helmet, and a baby being fed by a child dressed as an eagle.